Reacting to the uproar of BJP in the Parliament on completing 11 years for first Parliament attack in India, the Indian Government promised that it will search the roots of the key issue that why it has not hanged Afzal Guru in first place and understand why it didn't want to hang him till date. 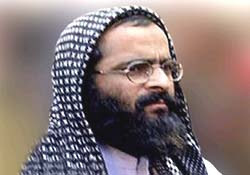 "We are committed to Indian people to answer why we had not hanged Afzal Guru till date. After getting that answer we will hang him," said Congress General Secretary Janardhan Dwivedi. Answering the questions of media on ruckus created by BJP, Mr. Dwivedi said "I don't understand why BJP creates so much of rhetoric on some paltry issues and keep the working of the session closed everyday. We have appointed a special five people search committee to find out the exact reasons why we have kept Afzal Guru's decision hanging till date." A five team committee will be headed by Rahul Gandhi with associates including Digvijay Singh, Kapil Sibal, Manish Tewari and Abhishek Manu Singhvi. According to sources, the committee will also fulfil the demands of every Indian that Rahul Gandhi should get a larger role in the party. By inclusion of Abhishek Manu Singhvi, the party will allow him to make a come back in the politics again to attract votes of strong Indian women lawyers lobby.